1000ltr Reconditioned UN approved IBC on timber pallet. 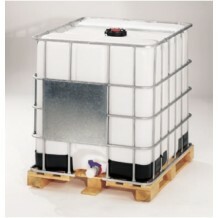 Suitable for hazardous and non-hazardous filling goods. Supplied with new caps, gaskets & tamper evident. Electronic & Ultrasonic leak tested with complete traceability.